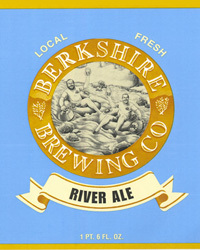 The River Ale pours a medium amber color with light brown fizzy head. Mostly diminishing and with good lacing, it did not hang around too long. The body was clear and the color of a penny. The nose dected a dominant sweet malt aroma with virturally no hop presense. Raw honey and a floral presence was also noted. The sweet aroma was very strong initially, but diminished over time. The initially heavy sweet taste evolved into a moderately sweet finish for an average duration. Light to medium in body and with active carbonation, the River Ale left our palates a little dry. We also detected a strong alcohol presence (it was 7%).